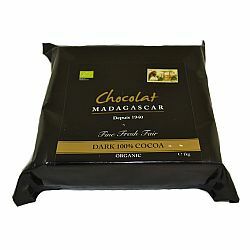 A mellow and approachable 100% Madagascan dark chocolate. The high cocoa butter content gives a smooth buttery quality that counteracts the intensity of the cacao. With no added sugar, the taste is entirely that of the Madagascan cocoa beans. The chocolate has typical red berry and fruit notes with a roasted undernote. This a 1kg block of dark chocolate couverture.